Got the mother-in-law staying? Have a couple of spare hours in between school runs? Like to learn about a new sport? Then why not take advantage of Wincanton Racecourse's FREE ADMISSIONS RACEDAY on Thursday 7th March. In association with Bathwick Tyres, free entry will be granted to every race goer who registers in advance with a Friday 1st March deadline. 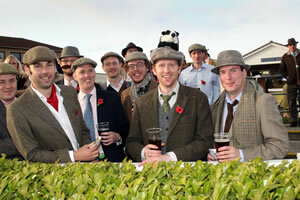 Registration can be done online at www.wincantonracecourse.co.uk or via the Racecourse Office on 0844 5793014. Racegoers who fail to register will be charged the standard race day admission fee starting from £14.00 (max 4 tickets per household). "Last year's free admissions race day was hugely popular and feedback indicated many newcomers took up the initiative. "We want to attract the occasional punter and residents that have not experienced racing from their Somerset track, while treating our loyal race goers. Not only will attendees receive an informative insight into the sport, but also competitive racing and Wincanton's charm which is why the legendary John Francome recently said our course was the tops." For added excitement and further insight into the world of horse racing, FREE ADMISSION RACEDAY will stage a step-by-step guide to dressing a jockey with local boy Joe Tizzard promising to reveal all! Betting advice and Paddock Panel for the latest news and tips will also be available. Gates open at 12:30pm on March 7 with the first race off at 2:30pm - so don't forgot to register for the chance to enjoy racing for free.